Project Ariana is more than just mood lighting. Razer has packed its full-spectrum lighting system into everything from its headphones to keyboards to mice over the past few years. Now, that 16.8-million-color platform is expanding into third-party products as well, the company announced at CES today. Specifically, in the coming months we'll see devices from a variety of manufacturers, including Lenovo, NZXT, Antec, Lian Li, Wicked Lasers, Philips Hue and Nanoleaf. Lenovo, for example, is integrating the technology into its desktop chassis. Philips, on the other hand, is tying the API module to its line Hue bulbs so that they'll change color in response to the onscreen action -- not unlike Philips' Ambilight televisions. 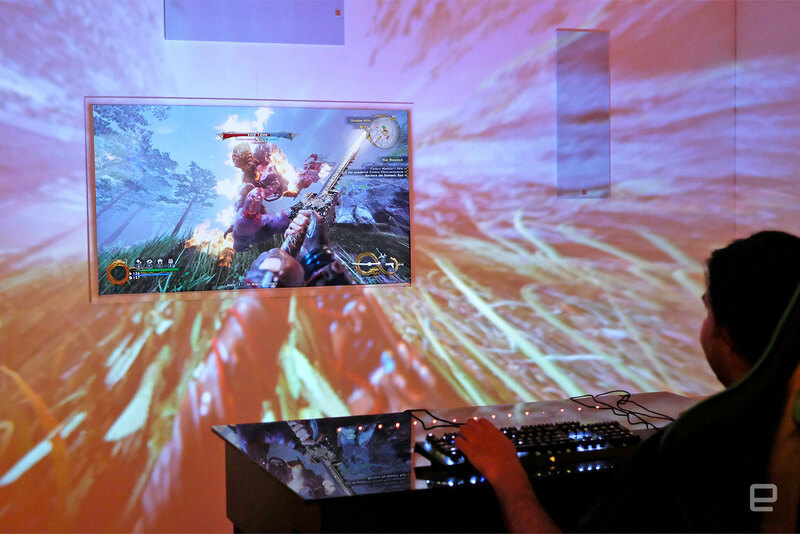 Razer is also working on a concept Chroma projector, dubbed Project Ariana, which will use a wide-angle fisheye lens to broadcast real-time video of your game onto an adjacent wall, creating drive-in movie-levels of immersion in your living room. There will be no need to calibrate these visuals thanks to a pair of 3D depth-sensing cameras that can automatically detect and account for variables like room lighting and furniture, "bending" the light around objects to create a flat-looking image. The concept is very similar to Microsoft's IllumiRoom, but this one is actually going to come out. Project Ariana doesn't have a price or a release date, but Razer says it hopes to have it ready by the year's end. When it's here, it'll also function as a regular 4K projector, which Razer believes will be superior due to its depth-sensing cameras.